The latest thing in organizing, sorting, storing, and securing your cutting tools. The outer shell can be mounted underneath a bench, desk, shelf, inside a cabinet, or just about anywhere. 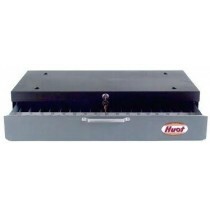 The drawer has a cam-lock to keep your cutting tools safely locked away. Norseman 190-AG Magnum Super Premium Jobber Length Drill Bit 1/2"
Magnum Super Premium Jobber Length Drills are made from Special Hi-Molybdenum tool steel. 135° split point for fast penetration and accurate starting without a center punch. Precision ground point, body, clearance and drill diameter for the ultimate in accuracy and performance. Body and clearance are gold surface treated for maximum lubricity. Drills are heat treated at 2185° F and then nitro-carburize finished at 950° F to be measurably harder than high speed steel. Space aged nitro-carburized steel withstands substantially higher drilling temperatures while maintaining sharpness. Recommended for use in work hardening grades of stainless steel and other hard metal drilling applications. Sizes smaller than #52 have non-split points.